206 pages | 19 B/W Illus. 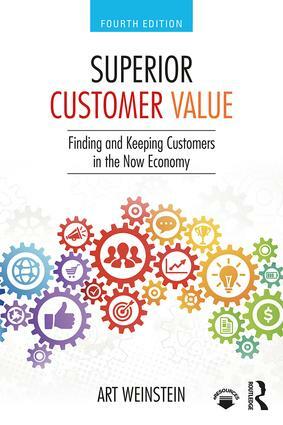 Superior Customer Value is a state-of-the-art guide to designing, implementing and evaluating a customer value strategy in service, technology and information-based organizations. A customer-centric culture provides focus and direction for an organization, driving and enhancing market performance. By benchmarking the best companies in the world, Weinstein shows students and marketers what it really means to create exceptional value for customers in the Now Economy. Learn how to transform companies by competing via the 5-S framework – speed, service, selection, solutions and sociability. Other valuable tools such as the Customer Value Funnel, Service-Quality-Image-Price (SQIP) framework, SERVQUAL, and the Customer Value/Retention Model frame the reader’s thinking on how to improve marketing operations to create customer-centered organizations. This edition features a stronger emphasis on marketing thinking, planning and strategy, as well as new material on the Now Economy, millennials, customer obsession, business models, segmentation and personalized marketing, customer experience management and customer journey mapping, value pricing, customer engagement, relationship marketing and technology, marketing metrics and customer loyalty and retention. Built on a solid research basis, this practical and action-oriented book will give students and managers an edge in improving their marketing operations to create superior customer experiences. Art Weinstein, PhD, is Professor of Marketing at Nova Southeastern University, Fort Lauderdale, Florida, USA. He was the founding editor of the Journal of Segmentation in Marketing and has published more than 80 scholarly articles/papers and eight books on customer-focused marketing strategy. Dr. Weinstein has consulted for many leading technology and service companies.